Spotted Eagle Ray at 50 ft.
Today’s blog entry begins with the fish picture of the week, which is of a Spotted Eagle Ray, cruising at a depth of 50 feet in the tropical waters off of Belize. 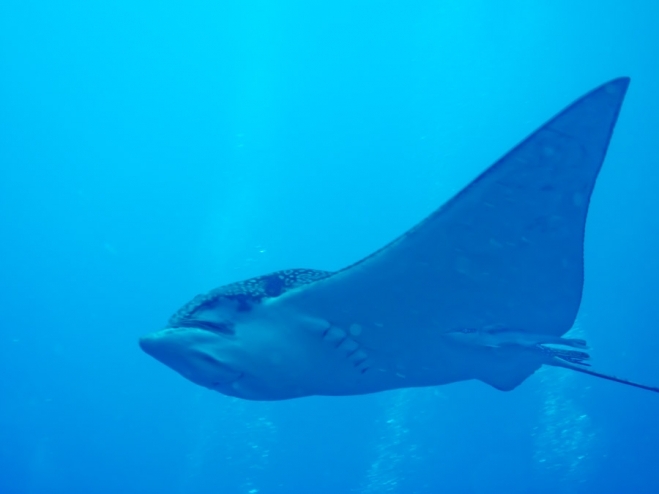 This ray has a wingspan of approx.10 feet and a very long tail of at least 15-20 feet. At the end of the tail are poisonous barbs, which was enough to discourage this diver from hitching a ride on its back. 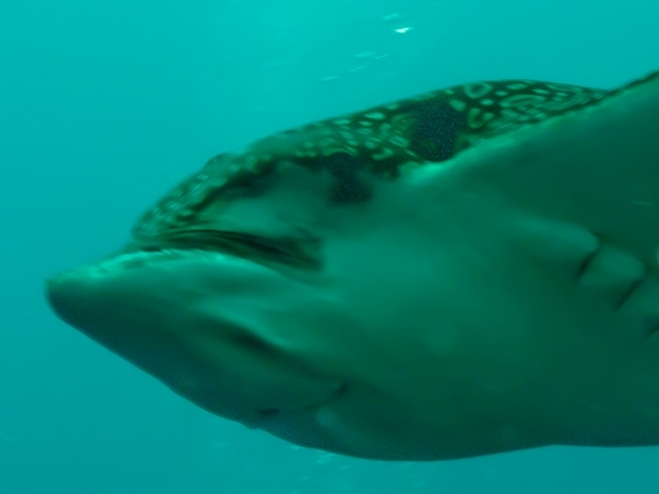 Unlike manta rays which are similar in size and filter feed as they swim through the water, the eagle ray has a distinct giant head and large jaws that only its mother could love, which are made for chewing into coral and the sandy bottom in order to extract tasty mollusks. In order to visit these wonderful warm-water creatures, one must travel to a warm climate, which can be both paradise and a living bug bite hell. Warm clear blue tropical waters surrounded by white sandy beaches and rain forests are the breeding grounds for a trillion tiny flying black sand fleas that can’t wait for you to get out of the water so they can feast upon your skin. If you are not a native to these areas, most likely you will be allergic to the bites. 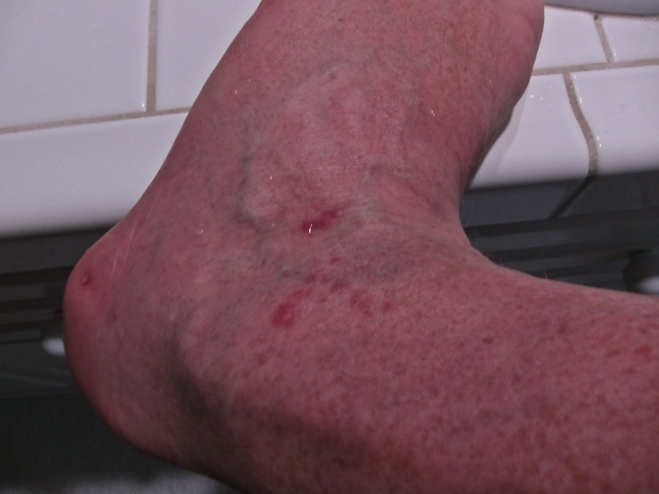 These bites develop welts, that are extremely itchy, the size of golf balls, and can keep you up in the middle of the night scratching like a flea-bitten dog, which is essentially what you become when you step out of your air-conditioned hotel room. After many years of experience in traveling to these beautiful dive sites in bug-infested tropics, experimenting with every lotion and potion (Benedryl, cortisone, alcohol, antihistamines, prescription and non-prescription remedies), I have found relief from a very unusual source – Seaweed Powder. 1. Take as hot a shower as you skin can stand and direct the water onto the bites. This helps to desensitize the skin and opens the bite for step #2. 2. Pour some Seaweed Powder directly onto the bites. With the water already on your skin, rub the powder which turns into a paste on top of the bite. 3. Allow the paste to set for a few minutes. As it dries, it also absorbs into the skin. Then rinse with hot water, not quite as hot as in step #1. The water will sting as it washes off the seaweed. But this stinging feels good and gives a lot of relief. If the itching returns within a few hours, repeat the process again as necessary. Sometimes an application of an astringent such as SeaBreeze (original formula) onto the top of each bite after the seaweed was can give additional relief in particularly bad cases. After a day or two of these applications, the bites tend to harden, dry out, stop itching, and will begin to heal. The only safe place to be in these regions is 50 feet below the surface chasing Spotted Eagle Rays. Pat - Living in the tropical areas means knowing what to look for, how to dress and how to respect nature.These areas have animals and live creatures that are unique to the tropics and it is their habitat.I live in SW FL and when at the beach I have to respect sea turtles, jelly fish and all of the water creatures.I am in their home..and they deserve to be treated with respect and awe.Knowing what to do to save these creatures from harm and to prevent being harmed is our responsibility.